This week’s Texture Tuesday’s requirements are to make a “dream-like” effect with our photo and one of Kim Klassen’s free textures. So, with that in mind, and for something new, I tried an outdoor photo. But, my first two images just didn’t work well with a dreamy look. when we awoke to find Jack Frost had literally slathered ice everywhere! Frost covers flowers from last summer. This time the image seemed to work for a soft, diffused, dreamy look. Image info: Nikon D300: Sigma 70mm macro, ISO400, f/7.1, 1/500. KK texture: Sybil @98% opacity. Thank you for visiting! Thanks for your “likes” and comments! All text and images are copyright © 2002-2013 and are the exclusive property of Judy Johnson (unless otherwise indicated). All Rights Reserved. All Images are protected under United States and International copyright laws. None of the images on this site are in the Public Domain. 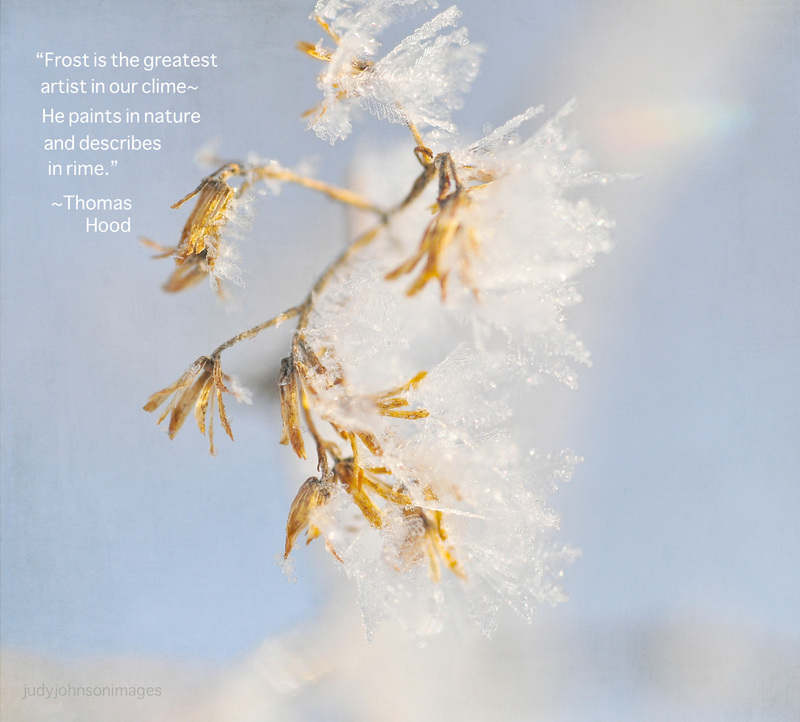 This entry was tagged Dream-Like, flowers, frost, gradient, Kim Klassen, PhotoShop Elements, quote, Soft Light mode, soft look, texture.